In situ cranium of "Karabo"
Australopithecus sediba is a species of Australopithecus of the early Pleistocene, identified based on fossil remains dated to about 2 million years ago. 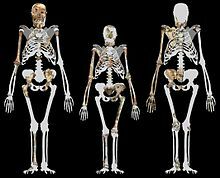 The species is known from six skeletons discovered in the Malapa Fossil Site at the Cradle of Humankind World Heritage Site in South Africa, including a juvenile male (MH1 also called "Karabo", the holotype), an adult female (MH2, the paratype), an adult male, and three infants. The fossils were found together at the bottom of the Malapa Cave, where they apparently fell to their death, and have been dated to between 1.980 and 1.977 million years ago. Over 220 fragments from the species have been recovered to date. 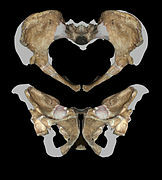 The partial skeletons were initially described in two papers in the journal Science by American and South African paleoanthropologist Lee R. Berger from the University of the Witwatersrand, Johannesburg and colleagues as a newly discovered species of early human ancestor called Australopithecus sediba ("sediba" meaning "natural spring" or "well" in the Sotho language). MH1 is disarticulated and 34% complete if skeletal elements known to be in an unprepared block are included (59.6% if small elements are excluded) while MH2 is 45.6% complete (again 59.6% excluding small elements) and exhibits partial articulation. 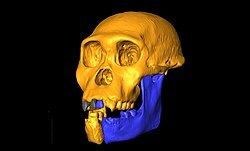 A later paper concluded Australopithecus sediba is distinct from, but shares anatomical similarities to, both the older Australopithecus africanus and the younger Homo habilis. Australopithecus sediba may have lived in savannas but ate fruit and other foods from the forest—behavior similar to modern-day savanna chimpanzees. The conditions in which the individuals were buried and fossilized were extraordinary, permitting the extraction of plant phytoliths from dental plaque. Matthew Berger displaying the fossil he found on the Malapa Nature Reserve. The first specimen of A. sediba was found by paleoanthropologist Lee Berger's nine-year-old son, Matthew, on August 15, 2008. While exploring near his father's dig site in the dolomitic hills north of Johannesburg, on the Malapa Nature Reserve, Matthew stumbled upon a fossilized bone. The boy alerted his father to the find, who could not believe what he saw—a hominid clavicle. Upon turning the block over, "sticking out of the back of the rock was a mandible with a tooth, a canine, sticking out. And I almost died", he later recalled. The fossil turned out to belong to a 4 ft 2 in (1.27 m) juvenile male, whose skull was discovered in March 2009 by Berger's team. The find was announced to the public on April 8, 2010. Also found at the Malapa archeological site were a variety of animal fossils, including saber-toothed cats, mongooses, and antelopes. Berger and geologist Paul Dirks speculated that the animals might have fallen into a deep 100–150-foot (30–46 m) "death-trap", perhaps lured by the scent of water. The bodies may have then been swept into a pool of water with a sandy bottom and rich with lime, allowing the remains to become fossilized. The fossil was dated using a combination of palaeomagnetism and uranium–lead (U-Pb) dating which showed that the fossils are no older than ~2.0 Ma. The presence of animal species which became extinct at ~1.5 Ma indicates the deposit is no younger than 1.5 Ma. The sediments have a 'normal' magnetic polarity and the only major period between 2.0 and 1.5 Ma when this occurred is the Olduvai sub-Chron between 1.95 and 1.78 Ma. Accordingly, the fossils were originally dated to ~1.95 Ma. Recent dating of a capping flowstone demonstrated this was not possible and the normal magnetic polarity sediments have since been correlated to the 3,000-year-long Pre-Olduvai event at ~1.977 Ma. Because of the wide range of mosaic features exhibited in both cranial and post-cranial morphology, the authors suggest that A. sediba may be a transitional species between the southern African A. africanus (the Taung Child, Mrs. Ples) and either Homo habilis or even the later H. erectus (Turkana boy, Java man, Peking man). The cranial capacity of MH1, which has been estimated to be at 95% of adult capacity (420 cm3), is at the higher end of the range for A. africanus and far from the lower range of early Homo (631 cm3), but the mandible and tooth size are quite gracile and similar to what one would expect to find in H. erectus; so similar are these features that, if found in isolation without other skeletal remains, they could be classified as Homo based on tooth and mandible size. However, the cusp spacing is more like Australopithecus. Regardless of whether Australopithecus sediba is a direct ancestor of early Homo or not, our understanding of the range of variation in early hominins has been greatly increased with the finding of these new specimens. A. sediba compared to its ancestor species A. africanus on the whole is described by Berger et al. as more derived towards Homo than A. garhi, especially showing a number of synapomorphies taken to anticipate the reorganization of the pelvis in H. erectus, associated with "more energetically efficient walking and running". The femur and tibia are fragmentary, but the foot combines an advanced anklebone combined with a primitive heel. Its cranial capacity is estimated at around 420–450 cm3 (26–27 cu in), about one-third of that of modern humans (1,200 cm3 (73 cu in)). Palmar view of the hand and forearm of A. sediba paratype MH2. A. sediba had a surprisingly modern hand, whose precision grip suggests it might have been another tool-making Australopithecus. Evidence of the precision gripping and stone tool production can be seen from Homo-like features such as having a long thumb and short fingers. 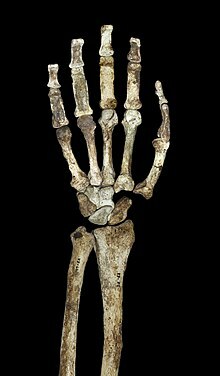 The nearly complete wrist and hand of an adult female from Malapa, South Africa presents Australopithecus-like features, such as a strong flexor apparatus associated with arboreal locomotion. A well-preserved and articulated ankle of A. sediba is mostly humanlike in form and function and possesses some evidence for a humanlike arch and Achilles tendon. However, A. sediba is apelike in possessing a more gracile calcaneal body and a more robust medial malleolus than expected. This shows that A. sediba may have practiced a unique combination of bipedalism and arboreality. As opposed to the authors of the initial description, who interpreted both fossils as a possible transitional species between Australopithecus and Homo, other palaeoanthropologists are reluctant to do so. In an accompanying news article published with the initial descriptions in 2010, detractors of the idea that A. sediba might be ancestral to the genus Homo (e.g. Tim White and Ron Clarke) suggest that the fossils could be a late southern African branch of Australopithecus, coexisting with already existing members of the genus Homo. This interpretation is based on the observation that the lower jaw, discovered by Friedemann Schrenk, of a 2.5-million-year-old fossil attributed to H. rudolfensis is the oldest-known fossil ascribed to the genus Homo. This specimen is thus presumed to be older than the Australopithecus sediba fossils. These critics continue to ascribe to A. africanus the status of precursor to the genus Homo. Criticism has been raised in a news report on the find in Nature, suggesting that the authors of the initial description failed to take into account the wealth of variation within A. africanus when defining the finds as an independent species. Additionally, the basing of the description of the species largely on the skeleton of a juvenile specimen has been subject to criticism, given that there is no certain way of saying to what extent adults would differ from juvenile specimens. More recent reviews appear to have accepted the specific status of A. sediba as an independent species from A. africanus and other early hominins. Moreover, the use of juvenile specimens as type specimens has been a common practice in palaeoanthropology: the type specimens of Homo habilis and Australopithecus africanus are themselves juvenile specimens. MH1 (left), Lucy (centre) and MH2 (right) Fossil remains described in 2010, superimposed on a generalized australopithecine background. A. sediba skeletons approximately 1.3 metres tall. ^ a b c d e f Berger, L. R.; de Ruiter, D. J.; Churchill, S. E.; Schmid, P.; Carlson, K. J.; Dirks, P. H. G. M.; Kibii, J. M. (2010). 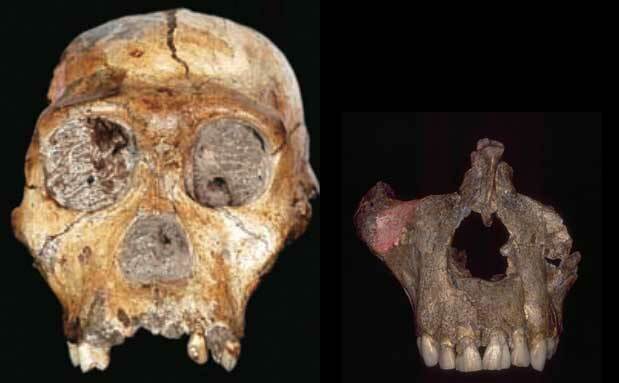 "Australopithecus sediba: a new species of Homo-like australopith from South Africa". Science. 328 (5975): 195–204. CiteSeerX 10.1.1.729.7802. doi:10.1126/science.1184944. PMID 20378811. ^ King, Juliet (June 4, 2010). "Australopithecus sediba fossil named by 17-year-old Johannesburg student". Origins Centre. Archived from the original on March 25, 2012. Retrieved July 9, 2011. ^ Gibbons, Ann (2011). "A new ancestor for Homo?". Science. 332 (6029): 534. doi:10.1126/science.332.6029.534-a. PMID 21527693. ^ African fossils put new spin on human origins story - BBC News - Jonathan Amos - Retrieved 9 September 2011. ^ a b Dirks, P. H. G. M.; Kibii, J. M.; Kuhn, B. F.; Steininger, C.; Churchill, S. E.; Kramers, J. D.; Pickering, R.; Farber, D. L.; et al. (2010). "Geological setting and age of Australopithecus sediba from Southern Africa". Science. 328 (5975): 205–208. doi:10.1126/science.1184950. PMID 20378812. ^ Val, Aurore (2013). A 3D approach to understand the taphonomy of the early Hominins from the Plio-Pleistocene cave site of Malapa (Ph.D.). University of the Witwatersrand. ^ Dartmouth College (17 January 2019). "Understanding our early human ancestors: Australopithecus sediba". EurekAlert!. Retrieved 19 January 2019. ^ Henry, Amanda G.; Ungar, Peter S.; Passey, Benjamin H.; Sponheimer, Matt; Rossouw, Lloyd; Bamford, Marion; Sandberg, Paul; de Ruiter, Darryl J.; Berger, Lee (June 27, 2012). "The diet of Australopithecus sediba". Nature. 487 (7405): 90–93. doi:10.1038/nature11185. PMID 22763449. ^ Boyle, Alan (June 27, 2012). "This pre-human ate like a chimp". MSNBC. Archived from the original on June 30, 2012. Retrieved June 28, 2012. ^ Wilford, John Noble (June 28, 2012). "Some Prehumans Feasted on Bark Instead of Grasses". The New York Times. Retrieved June 28, 2012. ^ a b c d e f g Celia W. Dugger; John Noble Wilford (April 8, 2010). "New hominid species discovered in South Africa". The New York Times. Archived from the original on 11 April 2010. Retrieved April 8, 2010. ^ Kate Wong, "First of our kind: sensational fossils from South Africa spark debate over how we came to be human", Scientific American, April 2012:30-39. ^ a b Kivell TL, Kibii JM, Churchill SE, Schmid P, Berger LR (2011). "Australopithecus sediba hand demonstrates mosaic evolution of locomotor and manipulative abilities". Science. 333 (6048): 1411–1417. doi:10.1126/science.1202625. PMID 21903806. ^ Part ape, part human - National Geographic - Retrieved 10 September 2011. ^ Zipfel B, DeSilva JM, Kidd RS, Carison KJ, Churchill SE, Berger LR (2011). "The foot and ankle of Australopithecus sediba". Science. 333 (6048): 1417–1420. doi:10.1126/science.1202703. PMID 21903807. ^ Balter, Michael (2010). "Candidate human ancestor from South Africa sparks praise and debate". Science. 328 (5975): 154–155. doi:10.1126/science.328.5975.154. PMID 20378782. ^ Cherry, Michael (April 8, 2010). "Claim over 'human ancestor' sparks furore". Nature. doi:10.1038/news.2010.171. ^ Spoor, Fred (October 5, 2011). "Palaeoanthropology: Malapa and the genus Homo". Nature. doi:10.1038/478044a/news.2011.171. Wikimedia Commons has media related to Australopithecus sediba.